16-20 participants will gather in the CEREV Exhibition Lab at Concordia to discuss issues of collaborative art and activism surrounding HIV/AIDS and create socially engaged digital imagery and text. The resultant image(s) from the session will be displayed in the courtyard of the FOFA Gallery at 1515 Ste-Catherine St West at 5PM at the end of the day. Although participants have been invited on the basis of community relevance, academic interest, and digital art literacy, the purpose of the workshop is to create purposeful and reproducible visual statements that speak to the reality and injustice faced by people living with HIV. Avram Finkelstein is the co-founder of the Silence=Death Project, an American art activist collective famous for their appropriation of corporate advertising imagery and deceptively simple messaging. The Silence=Death Project played a pivotal role in raising consciousness about the AIDS crisis in the US and has had a lasting influence on activist art and AIDS art the world over. He has long been involved in social justice movements across demographic boundaries as an artist, writer, and member of the AIDS art collective Gran Fury. He has been involved in The Coalition for Lesbian and Gay Rights and is a founding member of the AIDS advocacy group ACT-UP. 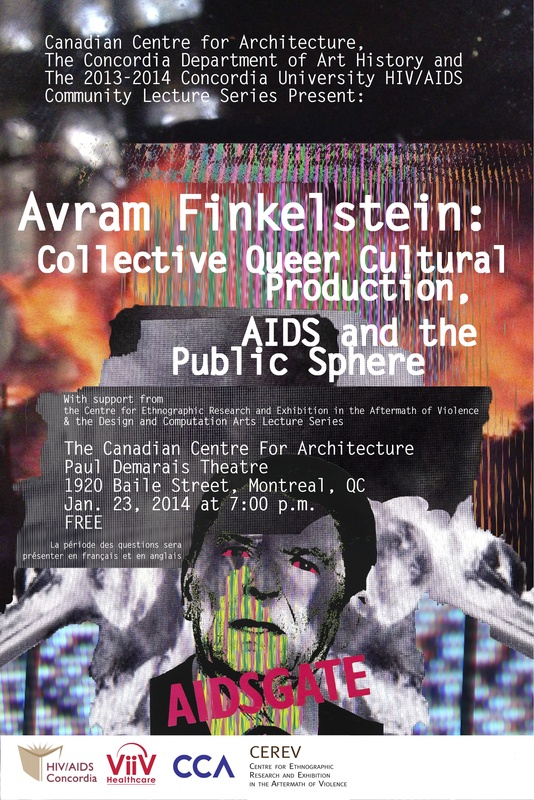 More recently, Finkelstein has shed light on AIDS cultural production curating exhibitions such as War, hosted by Visual AIDS. He has also written pieces reflecting on the AIDS crisis for POZ and Artwrit. “Research at the medico-legal borderland: perspectives on HIV and criminal law” by Alex McClelland. Somatosphere, Oct. 14, 2013. “Responding to the Criminalization of HIV Transmission or Exposure,” Canadian HIV/AIDS Legal Network brief.